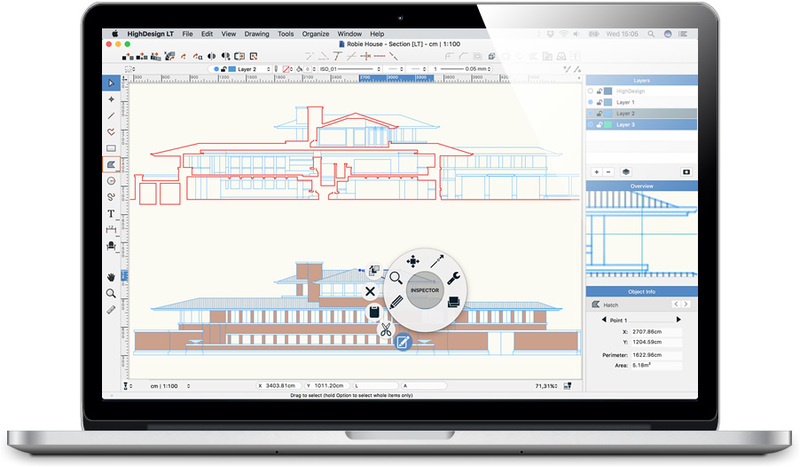 HighDesign LT is the light-weight, affordable CAD tool for your personal drafting needs. Easily create, edit and document drawings with the full set of drafting tools and editing functions, and share your work. Produce accurate layouts with all the benefits of the much appreciated HighDesign user experience. HighDesign LT uses the same file format as HighDesign 2017 Standard and Pro, and is compatible with other CAD software via the DXF drawing exchange format. All major image formats, such as JPG, TIFF, PNG with alpha channel and GIF are supported. Projects created with HighDesign Standard, Pro or Educational lose all non-supported information and objects when saved in HighDesign LT.
HighDesign LT imports and exports DXF drawings from version R12 to 2013-2016 as model data.